It’s been years since I’ve eaten a muffin. I used to like the regular sized ones made with apple or blueberry. On the rare occasions I baked, I would make lemon and buttermilk muffins with a crunchy sugar topping and I even remember making the now defunct bran and sultana muffins. (This was in the days when bran muffins competed with carrot cake in cafes that also sold wholemeal quiche.) But somewhere along the line muffins were given the Big Mac treatment, mutating into super-sized muffin/cakes overloaded with chocolate chips, or with savoury fillings that properly belong in a quiche. I’m happy the monster muffin fad has abated, ‘though why it has been replaced by the trend for tasteless over-dressed cup cakes is anyone’s guess. Anyway, the reason I’m writing about muffins is that I whipped up a batch today, using a recipe given to me by a friend who we visited over summer. Ngaire has a bach in the bay next to ours in the Marlborough Sounds. 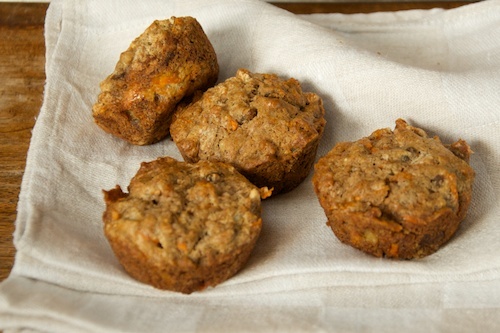 She invited us over for lunch and with coffee she served some light-as-a-feather retro-sized, retro-styled muffins. They were golden brown, warm and homely and they made me wonder why they had ever fallen from favour. I got out my notepad and pestered her for the recipe which turned out to be an amalgam of essential kiwi baking: banana cake + carrot cake + sultana muffin. 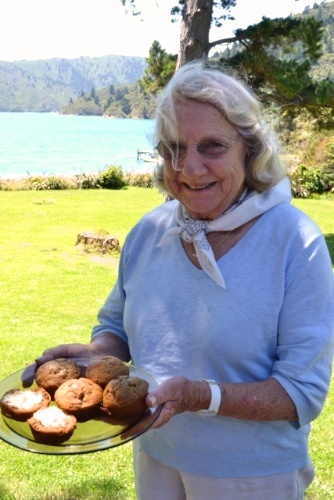 She gave me her recipe from memory, having more or less made it up, and she generously told me how she achieves a light texture to all her baking. Regardless of what the recipe says, she always separates the eggs, whips the whites and folds them in at the end. Preheat oven to 180°C fan bake. Grease a medium-sized 12 muffin tray. Soak sultanas in boiling water for 10 minutes then drain and set aside. In a large mixing bowl sift flour, baking powder, bicarb of soda, cinnamon, allspice and salt. In a smaller bowl, lightly beat egg yolks, honey and oil. Add to dry ingredients and fold together without over-mixing. Fold in mashed banana and grated carrot. Whip egg whites to stiff peaks and gently fold through mixture. Spoon dollops of mixture into muffin tins and bake for 20 minutes until a skewer inserted into the centre of a muffin comes out cleanly. Leave in tin until cool enough to handle. Cool muffins on rack. Split and serve with butter.